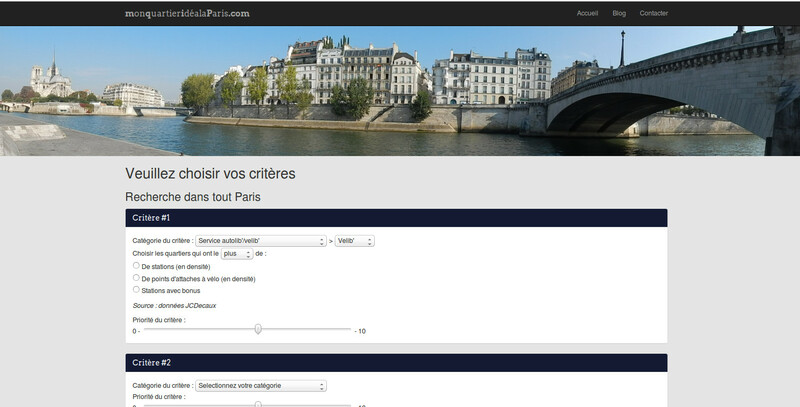 In a previous article, I talked about my website to find your ideal district in Paris. Since them, I have added some new features like a multimodal calculator, to find the journey time. For now, it is only available in French, but it will be soon in English too (I’ve alreay done a big part of the work). You can have a look on it thank’s to this link. Conky, when is my next bus ? Tisseo (Toulouse’s public transport operator) have an API which can be used to get real time bus at a stop (among plenty of others features). So I requested the access (it’s free but you have to register) and now I can play with it. I thought that a nice application would be to display the next bus using Conky (conky is a highly customizable software running on linux to display information on your desktop). 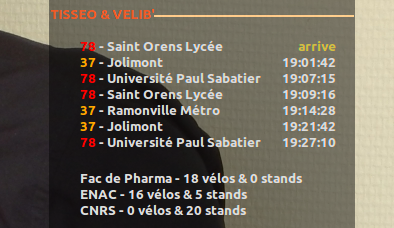 I also added the data from JC Decaux’s API about their self-service bike. For those wondering how I did here is a quick explanation : every 10 seconds, conky is executing a php script which will gather the data from the API and return what will be displayed on conky. I hope that this will give ideas to others ! First, it is a great way to provide data to people wanting to live in Paris (the concept can of course be applied to any city). It is very hard to come and live in a city that you barely know, therefore this kind of tool can help you. Secondly, this website shows what I consider as the true power of OpenData. In my opinion what is really interesting is not that you can do with a set of data but the fact that you can gather a lot of databases. We can now build powerful applications that can show things that were impossible to show before because everything was compartmentalised.